Queen Anne's Revenge: displeased . . . So the tiling's done, sadly it ended with a fizzle rather than a bang. The last row of tiles against the threshold was installed yesterday, and they are less than spectacular. Specifically, they wanted to shatter, crumble, and do anything BUT cut straight. Other than pulling out the big grinder I tried anything I could think of; in the end it just wasn't important or obvious enough to beat myself up over. I have to say, I honestly prefer working with salvaged tiles - mentally I'm more prepared/willing to deal with the curve balls thrown at me by the 100+ year old tiles I drag home than new ones I paid for. 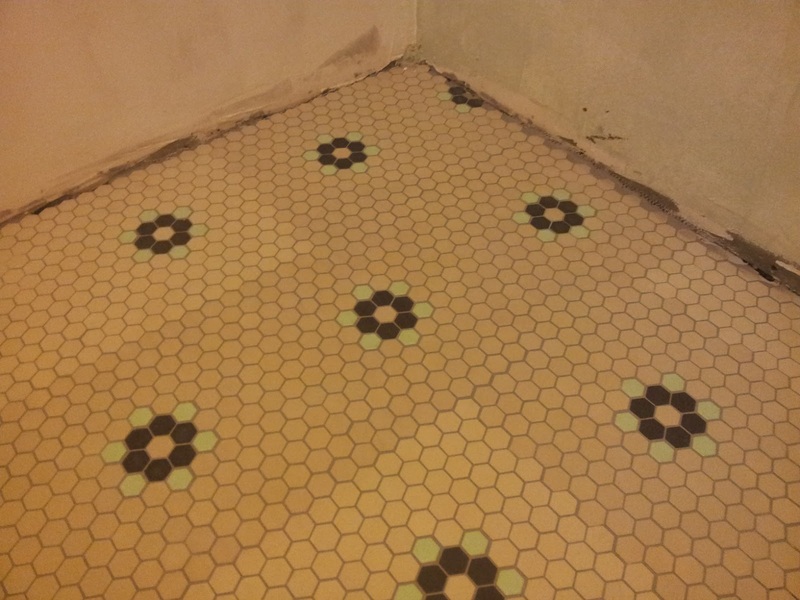 difference in the tile. I hoped in vain. 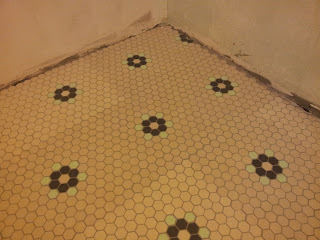 Although I had planned on just sealing the tile today, I got antsy and managed to grout half the floor - I would have finished except I ran out of grout. Being that grouting is one of my most dreaded tasks, I was surprised this went so smoothly - the black tiles worked beautifully for telling me whether or not I had gotten all the haze off. At least having to go out and buy more grout will help get me to the grocery store tomorrow. Next on the agenda is trimming out the stained glass windows and putting up the wainscoting. All in due time I guess.